[The Presence of God. Sermons] In worship Christians celebrate the origins of their faith. This constitutes also the meaning of sermon: it reflects the present of faith in the light of the experience of the origins. This is the experience of the truth of the Gospel: The present life of the people is God’s presence for the people, his community creating and reconciling care for them on which they can and should rely unconditionally. The professionalism of the sermon is its exemplary character. As expression of the self-reflection of the preacher on the origins of his faith it moves the listeners towards their own self-reflection on the origins of their faith. Through it they are not only connected with each other and the preacher but also with God, origin and goal of all human life. Eilert Herms, Dr. theol., Jahrgang 1940, ist Professor em. für Systematische Theologie an der Universität Tübingen. 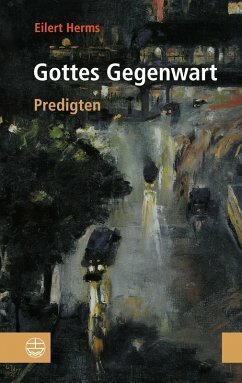 Er studierte Evangelische Theologie, Philosophie und Germanistik in Berlin, Mainz, Tübingen und Göttingen. Nach Promotion und Habilitation wurde Herms 1979 zum Ordentlichen Professor für Systematische Theologie nach München berufen, 1985 wechselte er in gleicher Funktion nach Mainz. Von 1995 bis zu seiner Emeritierung 2009 war er Ordinarius für Systematische Theologie in Tübingen, zugleich Direktor des Instituts für Ethik und von 2000 bis 2006 Dekan der Evangelisch-theologischen Fakultät.